April 4, 2015 : The Holy celebration of Easter Vigil at our church started at 7.00 pm in front of the Church, with preparation of the 'Paschal Candle". Rev. 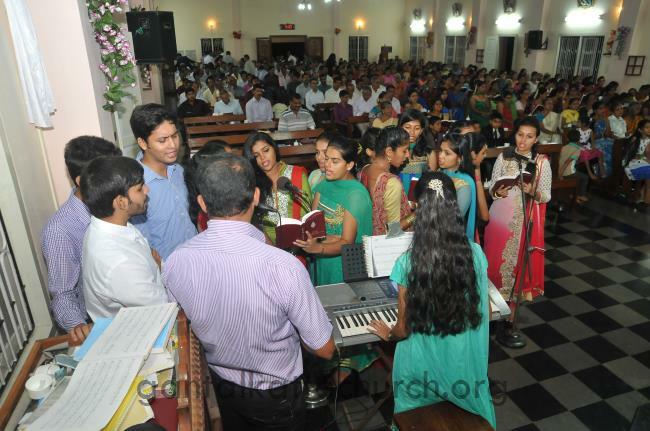 Sylvester Vincent Lobo, the director of Gladsom Home (minor seminary) Mangalore officiated the entire ceremony and was the main celebrant for the Mass. Fr Jesudas D'Costa the parish priest and Deacon Naveen Joseph Sequeira celebrated in the mass. Fr. Sylvester Vincent Lobo in his homily stressed how we can bear 'true witness' to the 'Risen Christ' and how we can be "Easter people" in our effort to be true Christian. Fr Jesudas in the announcement thanked everyone who joined hand in hand for the meaningful celebration of the Easter. At the end, the guest priest Fr. Sylvester expressed his joy by complementing.